Caliber: 12.7mm special subsonic Operation: semi-automatic Barrel: n/a Weight: 5 kg empty, less cope and silencer; 7 kg with scope and silencer, less ammunition Length: 795 mm with integral silencer Feed Mechanism: 5 rounds detachable box magazine. From Maxim Popenker website: http://world.guns.ru/sniper/sn72-e.htm "12.7mm VSSK (Vintovka Snayperskaya Spetsialnaya Krupnokalibernaya - special sniper rifle, large caliber) "Vychlop" (Exhaust) silenced sniper rifle is one of the most recent creations of famous Russian Instrument Design Bureau (KBP). Developed in around 2002 on special request from Russian FSB (Federal Security Service, successor of Soviet KGB), this rifle was first show to general public only in late 2005, during arms exhibition INTERPOLITEX 2005 in Moscow. This rifle is said to be in use only by special elements of FSB, which conduct mostly counter-terror and high importance anti-crime operation. Information on this weapon is very scarce, so its description below is based on manufacturer's leaflets that were displayed at the same exhibition. Author plans to extend this article as soon as more reliable and extensive information will be available. 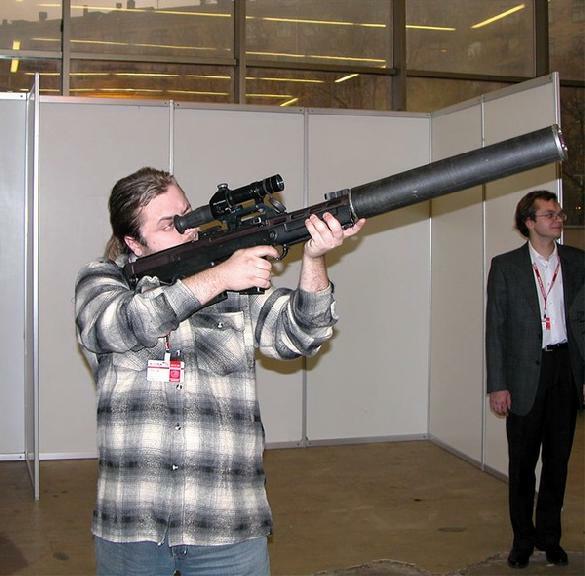 12.7mm "Vychlop" (Exhaust) silenced sniper rifle is developed for special operations that require silent firing and penetration much superior to that provided by 9mm VSS silenced sniper rifle. Typical targets for VSSK Vychlop are cars, terrorists in heavy body armor or behind covers like car bodies or other thick covers. The core of the VSSK complex is specially developed 12.7mm (.50 caliber) reduced power ammunition that launches bullets at subsonic muzzle velocities of about 290 meters per second (~950 fps). Exact dimensions of the new cartridge case are not yet published, but the overall length of the new 12.7mm round designated STs-130PT is given as 97mm, significantly less that of standard Russian 12.7x108 HMG round (145mm overall length). Standard loading for this round is precision machined solid bronze projectile with pointed nose, weighting around 59 gram (910 grains) or 76 gram (1170 grains) "high penetration" bullet. Accuracy is claimed as 1 MOA at 100 meters range with precision bullets, and maximum effective range is given at 600 meters. High penetration bullet can defeat Russian Class 5 (US NIJ Type III / High-Powered Rifle) body armor at 100 meters or 16mm steel plate at 200 meters. It must be noted that the concept of dedicated.50 caliber silenced weapon with special subsonic ammunition is not new. Back in early 1990s noted American ammunition specialist J.D.Jones of SSK Industries developed a specialized 12.7mm round known as .50 Whisper. This round was based on shortened .460 Weatherby Magnum case, loaded with heavy, pointed low-drag bullet. This cartridge is intended for use in specially modified bolt action rifles (like Winchester Model 70 or Sako TRG-S) fitted with silencers. Ballistic properties of the .50 Whisper are very close to that of 12.7 STs-130 ammunition - both claimed to have accuracy of 1 MOA and decent effectiveness out to 600 meters or so. However, it is not known if any of US law enforcement agencies ever used .50 Whisper or similar guns, while VSSK was developed especially for law enforcement and military special operations use. VSSK "Vychlop" rifle is fitted with large integral silencer that can be removed for storage, transportation and maintenance. Rifle itself is built using bullpup layout; it has integral folding bipod, and adjustable shoulder pad and cheek rest. Top of the receiver is fitted with scope rail, and rifle is provided with folding back-up iron sights. Apparently, this rifle is semi-automatic, but exact details of the action are unknown. Detachable box magazine holds five rounds of ammunition."